You will be given a reference e-book to read which has 218 pages And the test will be based on that e-book , you can take final test within 1 year of purchase. A Thai massage refers to an energizing and rigorous form of massage. Otherwise referred to as Thai Yoga massage, Thai massage is performed with the help of an expert therapist who utilizes his/her knees, feet, hands and legs to allow some parts of your body to move using a set of yoga like stretches. Lots of people define this type of massage as performing yoga without actually doing any work. It should be noted that therapists also use acupressure, joint mobilization and muscle compression when performing their job. This type of massage is said to be not only energizing but extremely relaxing as well. It is also popular for being one of the major branches of Thai traditional medicines which is now recognized as a medical discipline in treating various ailments not only in Thailand but in other places as well including North American and European countries and a lot of states in the US. Thai massage is also capable of providing numerous benefits. One of these is that it helps in improving your flexibility because your body will be moved into yoga-like movements and positions with the help of your therapist such as boat and cobra pose. It improves your flexibility since you will be doing yogic postures without the exertion of too much effort. Other benefits of the massage include improved blood circulation, increased energy, relaxation, effective body detoxification, improved body posture, more toned body, stronger joints, body alignment corrections, improved breathing and athletic performance and improved mental clarity and health. Working as a Thai massage expert is now easier because Brainmeasures which is widely recognized for its ability to provide the most comprehensive online certification courses to the public now includes a Thai massage certification program among its hundreds of offers. This Thai massage course is proven to be really beneficial because it effectively works in significantly enhancing the level of your knowledge about the field. Brainmeasures offers high quality and comprehensive Thai massage training which works in your attempt to become even more effective in this industry because it supplies relevant Thai massage information including its history, the basics of performing it, the specific things that you need to efficiently perform the massage, its health benefits and how you can help improve the health of individuals by performing Thai massage. 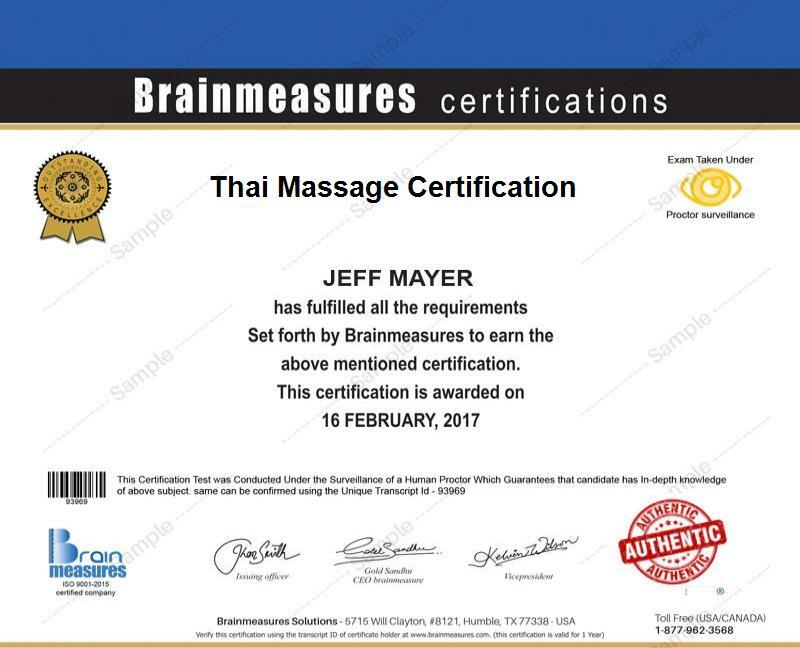 Receiving a Thai massage certificate from Brainmeasures is very advantageous for you since it works in your attempt to become one of the most effective certified professionals and experts in this specific industry. Enrolling in the Thai massage certification course provided by Brainmeasures is an effective move for a variety of professionals and individuals. It can offer numerous benefits to all aspiring and practicing massage therapists, health care providers and any other individuals who wish to understand Thai massage and become more effective in the field of providing holistic treatment to those who need them. Thai massage certification holders can also expect to earn a more decent income once they decide to work in the industry. With the help of your Thai massage certification, you will get the chance to work effectively as a Thai massage therapist which lets you earn within the range of $36,000 to $72,000 annually. This salary range will grow if you work in the best paying states and cities including Delaware, New York, Oregon, West Coast, California and Alaska.